Connecticut is a special place to live and work. It’s the gateway to New England and a bridge from the New York metropolitan area to cities like Providence and Boston. Connecticut is a state that attracts some of the country’s biggest corporations and you can see the development in areas like Stamford in recent decades. The Constitution State is also home to a stunning coastline and if you live or work in southern Connecticut, there are sights on the Long Island Sound that are not to be missed. That’s why you should consider holding your next Connecticut Corporate Event with Skyline Cruises. Our 3-deck luxury yacht the Skyline Princess offers full ship charters to Connecticut ports like Stamford and Norwalk as well as other ports around the tri-state area such as New Jersey, Westchester or Long Island. Our home port where our public dinner and brunch cruises leave from is located at the World’s Fair Marina in Queens. 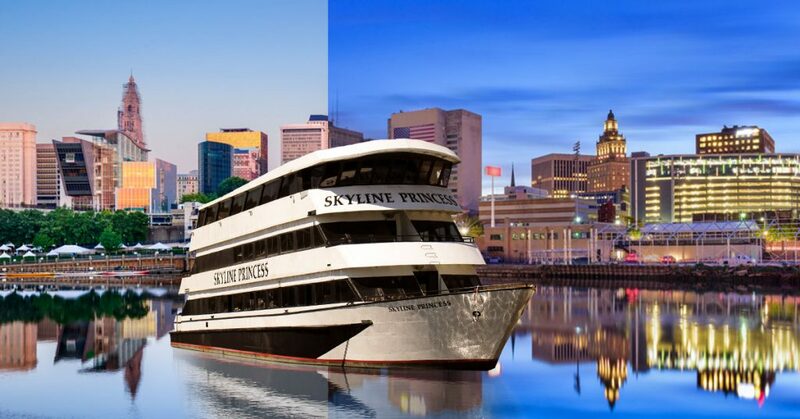 A Skyline Cruise is perfect for any occasion be it a wedding, Bar/Bat Mitzvah or a school event and we want to tell you why we’re perfect for a Connecticut corporate event. A full ship charter of the Skyline Princess gives you a delightful brunch or moonlight dinner cruise past some of the most scenic areas in the northeast. We’ll take you past Connecticut’s harbors and on the Long Island Sound. Bring your cameras, there’s sure to be memorable photo opportunities as the Skyline Princess will take you past nearby lighthouses like Greens Ledge Lighthouse in Stamford or Sheffield Island in Norwalk and some of the most beautiful and opulent homes in America. Some of these mansions are located on private islands. 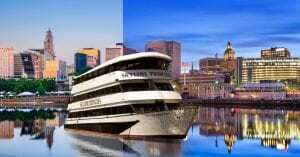 In addition to the sights, you’ll also get all of the amenities that make Skyline Cruises so popular around the area. You can use one of the decks of the Skyline Princess for a business meeting or seminar while having a gourmet meal on another deck. Skyline offers a variety of menu options all prepared by our in-house chefs. Your employees can have a blast on our third deck, also known as the Skylight deck. It comes complete with a dance floor and a DJ. The Skylight deck can be open or enclosed and the Skyline Princess leaves all year round. Whether you’re cruising the harbors near Connecticut or viewing iconic Manhattan skyscrapers from the deck of the Skyline Princess, Skyline is the perfect venue for any event. In addition to full ship charters, we’ll rent a private deck for a public dinner or brunch cruise for a smaller event. Very often we’ll rent a few tables or even one table for a small wedding. We know that every event is different and we’re used to working with different sized groups with different sized budgets. Skyline is in our 25th year of cruising the tri-state area and we love doing events in Connecticut. If you’re in charge of planning your company’s outings, give your employees a memorable cruise. Contact Skyline today.